Varied itinerary in woods, pastures and on winding roads, ideal to discover the Les Diablerets land-scapes. Starting out from Diablerets, bikers are confronted with an 8 km ascent. Don't lose heart because all along the way you will behold unusual sights. At a first brief stop towards le Torrent, you will cross fans of canyoning or tree adventure courses. On continuing towards Marnex, raise your head because you may see a few paragliders taking off, or maybe you will be tempted to taste some local cheese. 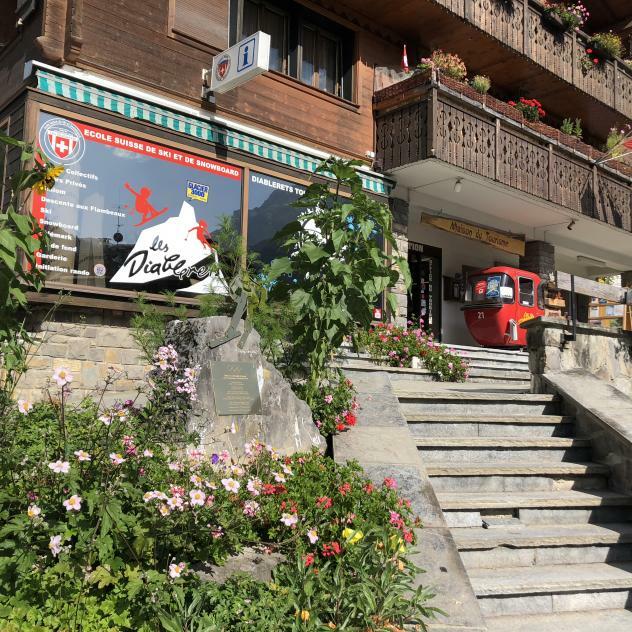 On continuing on the road that is suitable for vehicles in the direction of Ayerne, you will cross a small hamlet consisting of charming old chalets. You will cross vast green spaces that may let you think you of the ski fields in winter. Isenau marks the end of the ascent. Now you can enjoy whizzing down! The descending itinerary takes place on a road suitable for vehicles and on a forest path requiring more skill. Mountain bikers who do not appreciate technical descents may take the tarred road to Les Diablerets instead. A stop at Lake Retaud is a must. It offers an unrestricted view of the Diablerets massif. Further down after Col du Pillon, admire the Cascade du Dar on your left. On a closer look, you will probably spot a few mountaineers climbing the rocks.